I laughed out loud when I read that because so many people wear black in New York and periodically, when I’m talking to someone about this, I’ve said, “Yep, Manhattan is the City of the Dead.” Folks laugh when they hear this – but it’s true. Once when I was taking a red eye flight in December from LA to New York I looked around and saw that every passenger getting on the plane was wearing a black coat, scarf or jacket. This is 100% true. You may be thinking to yourself, “Who in the world wants to tour a cemetery?” Well, I thought the same thing when my husband and I decided to take a tour. However, we found it was not a spooky or scary experience. Actually, it was more like taking a step back in time – and very popular – judging by the number of tourists who sign up for these tours. Out of the 17 I have picked four cemeteries and provided links so you can pick and choose the one you want to tour or see. Did I just say, “not spooky?” Well, I just read that this cemetery is considered one of the most haunted gravesites in the entire United States. It goes back to 1789 and is located at 425 Basin Street in the Treme. In the span of just one block, this burial ground holds 700 tombs and over 100,000 of the dead – and counting, as it is still an active gravesite. For 229 years folks have reported run-ins with the ghosts that haunt the cemetery. The famous Marie Laveau or as she is more commonly known, “The Voodoo Queen of New Orleans” is buried in a crypt in this storied graveyard – that can only be visited with a guide – and is the final resting place of many illustrious Louisiana families. CLICK HERE to read more about the St. Louis Cemetery #1 Guided Tour. This burial ground was established in 1832 in the elegant Garden District of New Orleans. Why not take a stroll among the live oaks, magnolia trees and azalea gardens that give this area its name and reputation? Note: The Lafayette is right next door to Commander’s Palace – did you know that it has a luncheon special that includes a 25-cent martini? The limit is three. CLICK HERE if you’re up for a small-group, two-hour walking tour in the Garden District and the Lafayette Cemetery. Why not do three tours in one two-hour period? 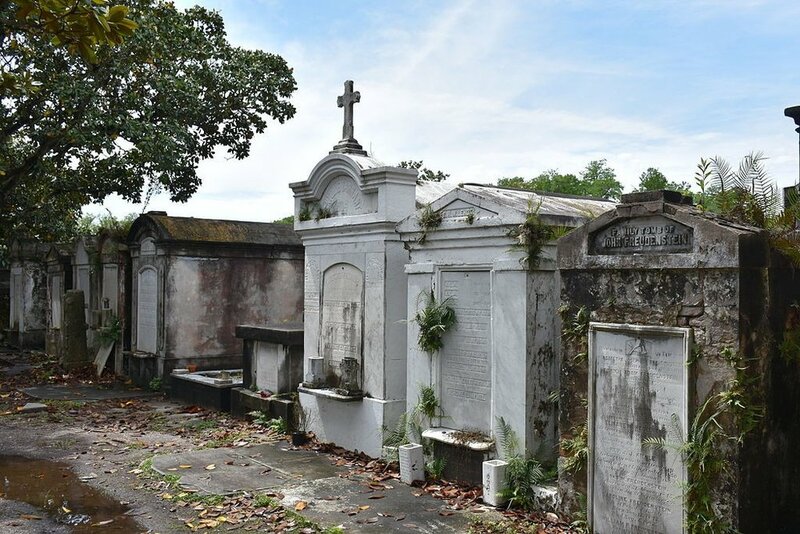 You can explore the famous French Quarter, visit the St. Louis Cemetery and see the Voodoo Queen’s tomb. CLICK HERE if you’d like to learn more about this three-in-one tour. This cemetery is located at 720 St. Louis Street in the Treme. It has a big plus, IT’S FREE. The hours are: Monday to Saturday, 9 am to 3 pm and Sunday 9 am to noon. There’s also free off-street parking if you go by car. For information, call 504-482-5065, or CLICK HERE for more news about this cemetery. Okay, we’ve whittled down a long list of 17 cemeteries for you so now it should be very easy to pick one that you like. I know which one I’d choose – but I’m not telling! CLICK HERE for an upbeat rendition of “I’ll Fly Away” by the New Orleans Superband – this famous gospel song was written by Albert Brumley during the Depression (1929).